Spring is in the air and you know what that means: Blooming buds, warm weather, and most important, the will to finally leave the house for a weekend jaunt. If you're in the mood for a no-muss, no-fuss weekend escape, you're in luck, because we've rounded up 10 quick spring getaways sure to put some spring in your step. Whether your ideal vacation is soaking up the sun or schussing down the slopes, we've found locales just a quick flight from many U.S. cities. Plus, we’ve included information on how to get there to make a spring fling as easy for you as possible. Spring getaways to Antigua and its smaller sister island, Barbuda, mean one thing: sailing. April marks the beginning of several annual events, including the Classic Yacht Regatta (April 18–23, 2013) and Antigua Sailing Week (April 27–May 3, 2013), one of the top regattas in the world and the biggest in the Caribbean. Thanks to constant trade winds and idyllic harbors, the island coasts are perfect for racing and attract a mélange of sailors, yachters, and admirers. On-land pursuits are just as appealing, with 365 sugar-white-sand beaches and historical attractions on Antigua, and fabulous resorts, pink-and-white shell beaches, and untouched Caribbean life found on Barbuda. How to Get There: Fly nonstop to Antigua (ANU) from New York (United; about 4.5 hours), Atlanta (Delta; 4.5 hours), or Charlotte (US Airways; about 4 hours); Barbuda is just 30 miles and a quick flight or ferry ride away. Book flights, hotels, and more on our Travel Search. Nestled in North Carolina’s Smoky Mountains region, Asheville is showing up on travelers’ radars thanks to its dynamic downtown area, lively cultural offerings, thriving arts scene, New Age nuances, and breathtaking mountain scenery. Architecture buffs love the town's Art Deco-influenced buildings, as well as the Biltmore Estate. Modeled after a French castle, Biltmore Estate ranks as the largest private residence in North America. Shoppers can scoop up fine arts and crafts at local artisan galleries, while nature enthusiasts can foray into the surrounding mountain preserves that burst with colorful wildflowers when spring comes around. How to Get There: Fly nonstop to Asheville (AVL) from Atlanta (Delta; about 1 hour), Charlotte (US Airways, United; about 40 minutes), Detroit (Delta; about 2 hours), Houston (United; about 2.5 hours), New York (United; about 2 hours), and others. Book flights, hotels, and more on our Travel Search. Music lovers would be remiss to overlook a visit to Austin, the "Live Music Capital of the World." With nearly 200 venues where you can tap your toes, Texas's capital is also the state's most culturally rich city, with museums and art galleries galore. Austin's laid-back vibe means it's a haven for musicians, artists, and performers who live and thrive there; for visitors interested in the arts, the possibilities for enrichment are endless. Trips in the spring are ideal, with temperatures averaging in the low 80s. It's also when bat-viewing is at its best – yes, you can watch up to 1.5 million bats (considered the largest urban bat colony in North America) take off every night from Austin's Congress Avenue Bridge in search of food. How to Get There: Take a nonstop flight to Austin (AUS) from Atlanta (Delta; 2.5 hours), New York (American, JetBlue, United; 4 hours), Chicago (American, Southwest, United; 2.5 hours), Los Angeles (American, Southwest, United; 3 hours), Detroit (Delta; 3.5 hours), San Francisco (JetBlue, United; 3.5 hours), or Boston (JetBlue; 4.5 hours). Book flights, hotels, and more on our Travel Search. 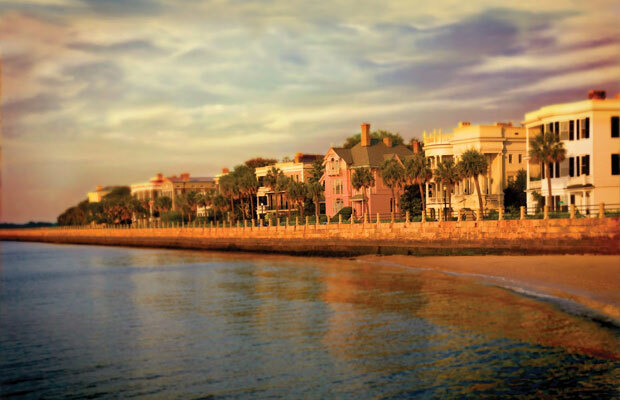 Few cities are more lovely, genteel, and downright Southern than Charleston, South Carolina. What’s not to love about a picturesque place full of historic landmarks, gracious homes, and charming inns? Visiting Charleston in the spring is best, with the temperatures warm but bearable, perfect for a walking tour or a carriage ride through the city. You’ll notice the pace is a little slower and the people are a little nicer than what you're probably used to; combine that with the blooming flowers, fantastic restaurants, upscale shopping, and a plethora of beach and golf options nearby and chances are you’ll wish your weekend break was a lot longer. How to Get There: Fly nonstop to Charleston (CHS) from New York (Delta, United, US Airways; 2 hours), Philadelphia (US Airways; 2 hours), Chicago (United, US Airways; 2.5 hours), Houston (United; 2.5 hours), Detroit (Delta; 2 hours), and Atlanta (Delta; 1.5 hours). Book flights, hotels, and more on our Travel Search. We would never recommend hopping over to the Sahara for a quick spring getaway – nor would we suggest rocketing to Mars anytime soon. And we don't have to, since you can practically experience both by spending a couple of days exploring the vast open spaces, arid mountains, rolling sand dunes, old ghost towns, and barren salt pans of Death Valley. Despite its macabre moniker, this national park comes alive with wildflowers through mid-April, and with summer highs soaring above 120 degrees and winter lows dropping below freezing, spring is the prime season to discover this 3.3-million-acre park’s many wonders: Hike the lowest place in North America (almost 300 feet below sea level), surf a sand dune, visit a Moorish-style castle, and cool down at the top-notch Furnace Creek Inn. How to Get There: Fly nonstop to Las Vegas (LAS) from San Francisco (Southwest, United, Virgin America; 1.5 hours), Los Angeles (American, Delta, JetBlue, Southwest, United; 1 hour), Minneapolis (Delta, Sun Country; about 3 hours), and direct from dozens of other U.S. cities; then drive 2.5 hours to the Furnace Creek Visitor Center via Death Valley Junction on California Route 190, one of the most scenic routes into the park. Book flights, hotels, and more on our Travel Search. Down by the bayou come spring, the avenues of New Orleans are full of rhythm. Always colorful, chaotic, and soulful, there’s no better way to discover the city where jazz was born than by attending its crowning fête, Jazz Fest (April 26–May 5, 2013). The 10-day cultural event gathers musical acts from across the globe to perform on multiple local stages, while Louisiana cuisine and crafts are showcased at the Fair Grounds Race Course. Home to the richest musical heritage in America, New Orleans is a city on the rise once again and Billy Joel, Fleetwood Mac, and The Black Keys are just a handful of the big names on hand to prove it in 2013. How to Get There: Fly nonstop to New Orleans (MSY) from New York (Delta, JetBlue, United; about 3.5 hours), Chicago (American, United, Southwest; 2.5 hours), Miami (American; about 2 hours), Denver (Frontier, Southwest, United; about 3 hours), Los Angeles (Delta, Southwest, United; 3.5 hours), and more U.S. cities. Book flights, hotels, and more on our Travel Search. Situated on Mexico’s Caribbean coast, just 42 miles south of Cancun, Playa del Carmen is a long way from the hard-partying ways of its northerly neighbor. That’s not to say that there’s no fun to be had here, where white-sand beaches, eco-parks, and nearby Mayan ruins are abundant. Spring getaways reign supreme, with tropical breezes and temperatures hovering around 80 degrees. Mayan monuments at Chichén Itzá are close enough for a day trip – and what better way to welcome spring than at the site’s spring equinox festival, when the shadows cast by the sun resemble a serpent slithering its way down the main pyramid’s ancient steps. How to Get There: Take a nonstop flight to Cancun (CUN) from Atlanta (AirTran, Delta; about 3 hours), Miami (Aeromexico, American; about 1.5 hours), New York (American, JetBlue, United; about 4 hours), Los Angeles (Delta, United; about 7 hours), and direct from several more; then drive or take public ground transportation to Playa del Carmen. Book flights, hotels, and more on our Travel Search. Though its heyday as a stomping ground for movie stars passed with Hollywood’s golden age, Catalina Island, 22 miles off the coast of Long Beach, California, is still an idyllic seaside escape with a year-round Mediterranean climate (and nary a freeway in sight). Avalon, the only real city on this 75-square-mile isle, is a striking place where the preferred mode of transport is by golf cart, not car. Check out the Art Deco mermaid murals adorning the grand 1920s circular dance hall known as the Casino – then sprout your own fins and scuba dive in the crystal-clear Pacific. Inland, you'll discover indigenous foxes, bald eagles, and the offspring of a bison herd brought to the island for a silent-screen-era movie shoot. How to Get There: Fly nonstop to Los Angeles (LAX) from Denver (American, Frontier, United; 2.5 hours), Phoenix (Delta, Southwest, United, US Airways; 1.5 hours), Seattle (Alaska, American, Delta, United, Virgin America; about 3 hours), and many other cities; or fly to Long Beach (LGB) from several cities and take the Catalina Express ferryboat (about 1 hour), which departs regularly from San Pedro (near LAX) and Long Beach. Book flights, hotels, and more on our Travel Search. Harmonious Santa Fe, New Mexico lives up to its moniker, “the City Different,” thanks to its combination of surreal desert landscapes, sprawling adobe architecture, and the third-largest art market in the United States. Though summer typically draws the largest crowds, spring outings are primed for visiting this city in the foothills of the Rocky Mountains, when crowds are fewer, prices are lower, and yucca flowers are in full bloom. Sample the best of native cuisine; shop for eclectic pottery, jewelry, sculptures and paintings; or take a leisurely stroll down popular Canyon Road. How to Get There: Fly nonstop to Santa Fe (SAF) from Dallas/ Fort Worth (American; under 2 hours) or Los Angeles (American; about 2 hours). Alternatively, fly into the better serviced airport in Albuquerque (ABQ), then catch a shuttle or rent wheels (about an hour ride) on to Santa Fe. Book flights, hotels, and more on our Travel Search. If your idea of a great spring getaway involves snow instead of sand, head to Whistler, British Columbia, where one of the longest ski seasons in North America keeps snow bunnies schussing as late as early June. Whistler boasts over 8,000 acres of skiable terrain, 12 alpine bowls on three glaciers, and more than 200 marked trails. As an added bonus, the beautiful village has enough shops, nightlife, restaurants, and events to keep even non-skiers happy – and plenty of shiny new Olympic-legacy attractions (from 2010's Winter Games) worthy of exploration. How to Get There: Fly nonstop to Vancouver (YVR) from Chicago (Air Canada, United; 4.5 hours), New York (Air Canada, United; 6 hours), San Francisco (Air Canada, United; a little over 2 hours), Los Angeles (Air Canada, Alaska, American, Delta, United; about 3 hours), and Seattle (Air Canada, Alaska, Delta, United; 50 minutes). Whistler is roughly a 2-hour drive from Vancouver along Highway 99, also called the Sea-to-Sky Highway. Bus and taxi services are available to make the trip. Book flights, hotels, and more on our Travel Search.